From 2010 until July 2018, Bruce Wade assumed the role of Senior Administrative Managing Partner on Mullen & Filippi's three person Management Committee and is in charge of finances for the Firm. Bruce has also managed the Bakersfield office since 1990. 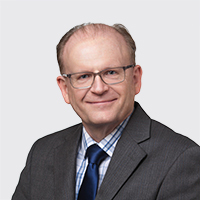 Bruce Wade has been defending self insured employers and insurance carriers in workers' compensation cases for over thirty years, all with Mullen & Filippi. He has been certified as a specialist in workers' compensation law since 1993. He has spoken at various trade educational conferences and conducted training seminars for clients. Bruce Wade received a BA with High Honors, majoring in Mathematics, from the University of California at Davis. At Davis he served as President of the Latter Day Saint Students Association. His coed inner tube water polo team lost in the finals of the University wide intramural tournament. Mr. Wade graduated from the J. Reuben Clark Law School at Brigham Young University. Bruce Wade has been a member of the California State Bar since 1984. He has served on the Board of Directors of the California Workers' Compensation Defense Attorneys Association from 2000 through 2015. He has served as the President of the Northern California Workers Compensation Defense Attorneys Association and the President of the California Workers Compensation Defense Attorneys Association. I love workers' compensation defense because I come in every day to a different challenge. I like to think that I am an important part of a system that encourages injured workers and their employers to efficiently resolve disputes and to move on, hopefully to a continued mutually beneficial working relationship. Over the years, the legislature and courts have made, in my judgement, some missteps in accomplishing that goal, but I seek to accomplish it as best I can within the system we have. While there is a selfish pleasure in defeating the adversary, I believe that it is often better for both parties to work out a mutually agreeable solution through settlement. I have spent my life performing music. I am currently a member of the Bakersfield Master Chorale, a community choir that has been delighting Bakersfield audiences for over 80 years. I also serve as a vice president of the Chorale and have been on the Executive Committee for the last four years. I have played the piano since I was 8 years old and played the bassoon in high school. I have performed in several musical theater productions including Fiddler on the Roof, Music Man, Joseph and the Amazing Technicolor Dreamcoat and sang a duet as Maurice in Beauty and the Beast. I love all kinds of music, but I have a special passion for classical music, especially opera.